Lafarge Zambia has launched the Lafarge Lusaka Marathon whose theme is “Malaria Ends with me, Beat the Buzz” which is premised on having a Malaria free Zambia. Speaking during the media briefing held today at Lafarge Zambia Head Office, Chief Executive Officer Vincent Bouckaert whose speech was delivered on his behalf by the Chief Financial Officer Mrs Chrissie Moloseni said Lafarge has allocated this year’s Marathon a budget of K900, 000 with a target of 5000 participants in all the races. Bouckaert announced that the event is slated for May 26, 2018 from the initial May 5 to allow more people for registration and increase international participation at Levy Mall in Lusaka. He further disclosed that Lafarge Zambia has taken into consideration all the feedback received from last year and continue to receive to ensure the Marathon is better organised to achieve the international standard record. In achieving this, Lafarge Zambia has implemented the recommendations given by the International Association of Athletics Federation (IAAF) which include but not limited to road closures to ensure safety and security of the runners, available medical services, the full Marathon routing and certification with IAAF to one loop. Other improvements will be to ensure Medals for the runners are of high quality as well improved logistical requirements for the Marathon. Bouckaert further recognised some of the sponsors that have so far come on board such as Madison General, Levy Mall, InterContinental Hotel, PATH who have been working in collaboration Ministry of Health under the Zambia’s National Malaria Elimination Programme, Fairly bottling, Reload logistics, Total Zambia, AB and David, Road Transport and Safety Agency (RTSA), Zambia Police and Lusaka City Council. 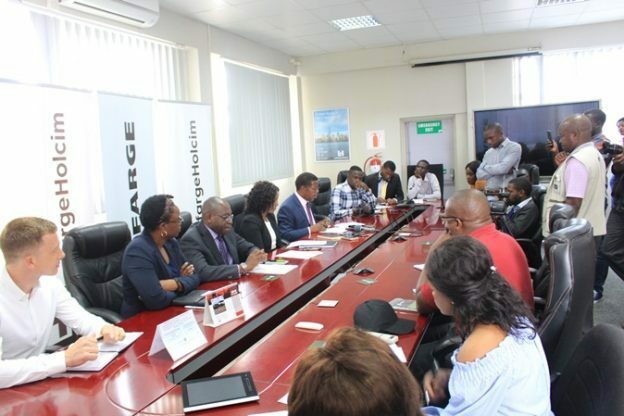 He has since expressed confidence that more sponsors will partners with Lafarge for the success of the event and taking into consideration the paradigm shift towards health living that Zambia is slowly embracing. And speaking earlier at the same event the Zambia Amateur Athletics Association (ZAAA) President Elias Mpondela thanked Lafarge Zambia for partnering with the Zambia Amateur Athletic Association (ZAAA) in promoting the Lafarge Marathon. Mpondela expressed confidence that the Marathon will grow to attain international status and recognition such as from the International Association of Athletics Federations (IAAF) & the Confederation of African Athletics (CAA). Meanwhile the Managing Director for Madison General Insurance Chabala Lumbwe said Madison will continue to support Lafarge Lusaka Marathon as it promotes wellness which is one of Madison’s Corporate Social Responsibility pillar. He added that Madison General will provide general insurance for all the runners and staff for the marathon 2018.